February 9, 2017, 3:52 PM · Having grown up in Oslo, Henning Kraggerud long has felt an admiration and affinity for his fellow Norwegian composer and violinist Johan Halvorsen (1864-1931). Little did he know that he would be involved in the resurrection of one of Halvorsen's most mysterious works: his long-lost Violin Concerto. The world premiere recording, Halvorsen & Nielsen: Violin Concertos, comes out this week, featuring Kraggerud playing his 1744 Guarneri del Gesù. He also performed the work for its 21st-century premiere live performance in Norway last July. Henning Kraggerud. Photo by Kaupo Kikkas. Most of us know Halvorsen for his much-loved duet for violin and viola, the Passacaglia after a theme by Handel, aka the "Handel-Halvorsen." But at the turn of the 20th century, Halvorsen stood at the center of musical life in Norway, as conductor and composer-in-residence at the theaters in Bergen and Oslo - then called "Kristiania." "He was indeed very famous in his own day, and soloists and composers around Europe loved to stop by Oslo and play concerts with him. They knew the conductor in Norway at the National Theatre was extremely good," Kraggerud explained, speaking with me over the phone from Norway in January. Halvorsen often kept famous company: Rachmaninoff was a regular visitor, and the young Bartok was a big admirer, among others. "When Halvorsen's Violin Concerto was played in Oslo for the first time in 1909, the theatre was completely filled up, for two or three nights in a row," Kraggerud said. And the concert had considerable competition: "That very same day, Fritz Kreisler played a concert in another hall in Oslo, yet even with that going on, people wanted to hear the premiere of Halvorsen's violin concerto." Giving the premiere was the Canadian violinist Kathleen Parlow, then 18, who had played the work with the Berlin Philharmonic just a few months before the Oslo performance. Audiences received it with enthusiasm, though critics picked at it for lacking conventional form. Though Parlow also had planned to play the work in England, Netherlands and the U.S., she gave it just one more performance, in Utrecht in 1910. That was the last time it was performed for more than a century. When Halvorsen retired in 1929, he burned a number of manuscripts -- the violin concerto among them. "Halvorsen wasn't appreciated as much as he should have been -- these days of course we appreciate him a lot, but his son (the actor Stein Grieg Halvorsen) told me that his father had become quite bitter," Kraggerud said. When the new Oslo Philharmonic was created, Johan Halvorsen had high hopes of becoming its chief conductor, but instead he lost most of his musicians from the National Theatre, leaving him to conduct a much smaller orchestra. The loss of Halvorsen's Violin Concerto was long-mourned in the music books of Norway. "When I grew up, I loved Halvorsen's music," Kraggerud said. "I had read about this concerto; everybody knew that it had been written. But I also knew it was lost forever, because that's what all the books said." 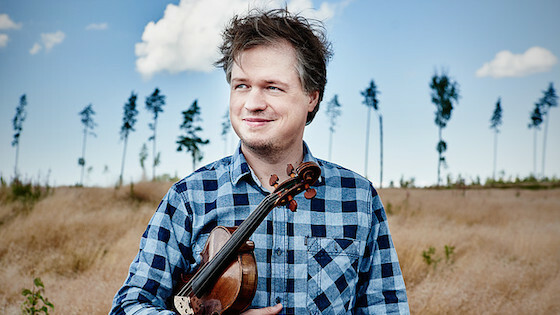 Imagine Kraggerud's surprise, when he received a phone call from conductor Bjarte Engeset, inviting him to come read Halvorsen's Violin Concerto, the score of which had been discovered at the University of Toronto's Faculty of Music Library. "When I suddenly realized that it wasn't lost but it was actually there, I put everything together very quickly," Kraggerud said. He, along with Engeset and Norwegian Chamber Orchestra, gave the work its first modern performance on July 3, 2016, at the Risør Chamber Music Festival in Norway. Why had the concerto retained its "lost forever" status for so long? "The last known place the concerto was played was in Utrecht, and Kathleen Parlow probably brought the scores with her," Kraggerud said. "But then later, if she learned that Halvorsen had burned the manuscript, which she probably did, he might have instructed her to do the same. She probably then just didn't do it, but then refrained from playing it publicly." Upon her death in 1963, many of Parlow's possessions were donated to the University of Toronto’s Faculty of Music Library. But the score for the Halvorsen, instead of being catalogued with other sheet music, remained among her personal possessions, such as pictures. It was only when an enterprising curator named James Mason was "spot-checking for anomalies in the library's database" that the score was found in early 2016. "They found the full score and the orchestra parts, but not a separate violin part. And not the original piano reduction, which they know was made," Kraggerud said. In other words, they had to glean the solo violin part from the full score. "The full score is very useful, but still, we would assume that the separate violin part which Kathleen Parlow had, would probably have some corrections or alterations, if it's ever found." Kraggerud continues to look for that piano reduction, too. "We know that Halvorsen sent a piano reduction to Adolph Brodsky, so I actually contacted the museums and collections in Manchester to see if the Brodsky collection did have that." No luck so far. "Halvorsen was also planning to send it to Leopold Auer -- both Leopold Auer and Brodsky were teachers of Halvorsen; he was their pupil. So I have been really trying to find that, because it would also be very interesting to have Halvorsen's own piano reduction." Nonetheless, a great effort was made to create the best edition possible, he said. Violinists interested in learning the piece can click here to find a Norwegian National Heritage Edition of the Halvorsen Violin Concerto, a critical edition with footnotes explaining any discrepancies. What is the concerto like? "When I started learning it, first of all, I quickly realized that it was not an easy concerto," Kraggerud said. "I also saw how cleverly it was written for the instrument. Halvorsen was an excellent violinist himself. I realized more and more...that it's a little masterpiece." 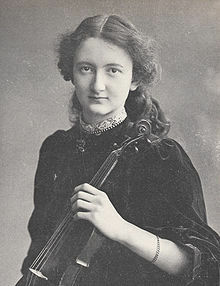 Halvorsen flavored the concerto with Norwegian folk music, including references to Hardanger fiddle music and in the last movement, a dance called the halling. "It's a dance which always ends by the main dancer trying to kick a hat either off a person or off a staff, held high in the air," Kraggerud said. Halvorsen gave this a musical equivalent in the concerto: "At the very last chord, you can hear the violin hitting a high harmonic on the G-string as a musical equivalent of this trademark of that dance." The tension remains high all the way to the end of the dance "...because you never know if you're going to miss the hat, or in the case of the violin, the harmonic! It's a very exciting dance." Kraggerud, who is also Artistic Director of the Arctic Philharmonic Chamber Orchestra, is prolific composer himself, having written more than 200 works. "I feel very related to Halvorsen, being both a composer and violinist," said Kraggerud. "I really do like the old violinist composers like Halvorsen, Svendsen, Ysaye, Kreisler, Spohr. And speaking of violinist composers, of course Mozart was a violinist composer, Haydn was a violinist composer as well." Kraggerud firmly believes in the union of playing and composing and strives to encourage it in his students and in the budding composers he commissions. "Both for the sake of composing, and for the sake of playing, I don't think it's healthy that they have separated," Kraggerud said. February 10, 2017 at 12:43 AM · I'm looking forward to the release of the CD! February 10, 2017 at 11:28 AM · Fascinating story, many thanks Laurie! And does he really hate the old violist composers? February 11, 2017 at 04:49 AM · John, this was a conversation about Halvorsen; I didn't ask him for a comprehensive list of all stringed-instrument-playing composers! But you are welcome to create such a list and post it, if you wish! February 12, 2017 at 03:07 AM · Thanks for posting this blog, Laurie. The excerpt was amazing! It must be really emotional to find such a piece that was thought to be lost and probably more so to bring it to life through performance! I can't wait to hear it in its entirety.